New JBL Endurance Peaks are truly wireless in-ears for £130 | What Hi-Fi? The sporty Endurance Peaks are waterproof, come with a charging case, and can last for 28 hours. At IFA 2018, JBL took the lids off a brand new pair of truly wireless in-ears: the JBL Endurance Peak. Designed to suit a sporty lifestyle, the Endurance Peaks are waterproof (IPX7 rated), have a flexible loop so they fit securely around your ears, and come in a rugged charging case. The in-ears have a combined battery life of 28 hours (20 hours from the charging case, four in the headset), and if you're running low, you can speed-charge them for 10 minutes to get an hour of juice. The wireless buds have touch controls for music playback and taking calls, you can set them to stereo or mono mode, and its PowerHook technology automatically switches the wireless buds on or off when you put them on or take them off. Clever. The JBL Endurance Peaks are available in a black finish only and will cost £130 when they go on sale in November 2018. Can’t wait that long? There's also the JBL Free wireless in-ears, which are on sale right now for just £120. 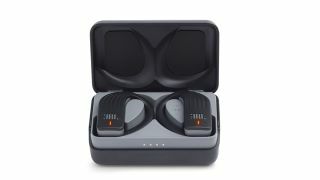 Available in black or white finishes, the JBL Frees offer 24 hours of playback on a combined charge (20 of those are from the included charging case), they are splash proof (IPX5 rated) to protect against the rain, promise “JBL Signature Sound” and also have an integrated mic for hands-free calls.